Two years ago I wrote about trading in one dream for another when we didn't get language immersion in Round 1 of the SFUSD lottery. Here's a confession. I never gave up on immersion. We've stayed in the SFUSD lottery for the Korean Immersion Program at Claire Lilienthal through Round 5 for the last three years. 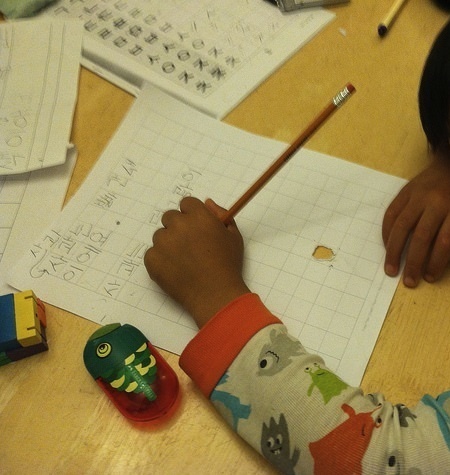 For kindergarten, one spot opened up for Claire Lilienthal's Korean immersion class in Round 5. There were two children in the waitpool, my child and another. The other child got the spot. For kindergarten, I saw my child's bilingualism fade. We enrolled in Saturday language school and did up to 3 hours of homework a week just for Saturday school. My child passed the SFUSD language proficiency test for 1st grade, and we went through the lottery again. We didn't get in. No one left the class between kindergarten and 1st grade. In first grade, bilingualism dwindled further. We tried a different Saturday language school with smaller classes and added individual tutoring twice a week. My child managed to pass the SFUSD proficiency test for 2nd grade, and we entered the lottery a third time. We won't get in. I heard that no one left between 1st grade and 2nd grade. It's hard, after a summer of being asked, "Mom, when I grow up, can I live in Korea?" and "If my Korean gets good enough, can we go to Korea next summer?" and just tonight, "But how will my Korean get good enough if I don't go to Claire Lilienthal?" You can't always get what you want. That's the hard truth of the SFUSD lottery. We won't try again. It's not worth it for just 3 years, especially when 2 of those years would be in a large combined 4th-5th grade class. I might consider it if we weren't happy with our current school, but that's not the case. My child loved our school's kindergarten and first grade teachers, and just this week said, "I can't wait to go back to school." It still seems magical to me how much learning has happened in the last 2 years, with seemingly little effort and no parental involvement, quite the contrast to the pitched battles we've had over Korean homework. For families who hear from SFUSD this week, congratulations! For those who don't have luck in Round 5, you're not alone. And to those 8 families still in the CL KIP kindergarten waitpool, we look forward to meeting most of you in Saturday school. Feel free to share the outcome of your Round 5 below.